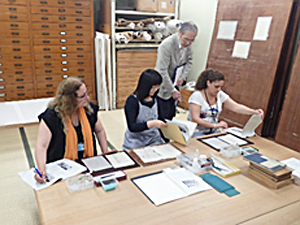 From June 25th through July 6th, 2018, Tokyo National Research Institute for Cultural Properties organized a workshop on the conservation of historic textiles in collaboration with the Ministry of Culture in the Republic of Armenia. Based on the cooperation agreement regarding the cultural heritage protection area established between them in 2014, this workshop was implemented for the second time following last year. 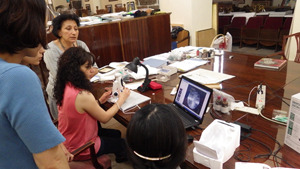 This workshop was conducted at the Scientific Research Center for Historical and Cultural Heritage and the Museum of the Mother See of Holy Etchmiadzin with Dr. Mie ISHII, a visiting researcher from the Japan Center for International Cooperation in Conservation, and Ms. Midori YOKOYAMA from the NHK Culture Center Saitama, as lecturers. Fourteen trainees from seven institutions such as museums and galleries in Armenia attended the workshop. 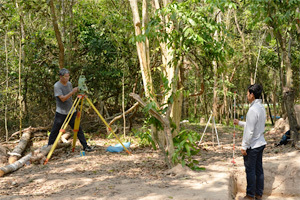 At the Scientific Research Center, historic textiles unearthed from archaeological sites in the 12th century, which the Center possesses, were analyzed by microscope before practical training on how they should be stored. At the Museum of the Mother See, the trainees stitched the Museum’s textiles for reinforcement with more advanced techniques before exhibiting them at the Metropolitan Museum of Art in the United States in September. 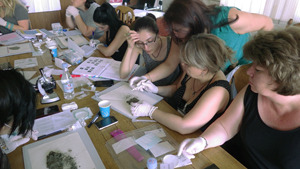 This time, we provided practical training with historic textiles that provided the trainees with very good experience. We will organize a workshop in 2019 as well to transfer our knowledge and techniques to Armenian specialists. The Tokyo National Research Institute for Cultural Properties organized a workshop for the conservation of historic textiles titled “Textile Art and Conservation: Knotting the Past and the Present” jointly with the Ministry of Culture in the Republic of Armenia from September 11th through 20th, 2017. This workshop was implemented based on the agreement on cooperation in the cultural heritage protection area concluded between them in 2014. 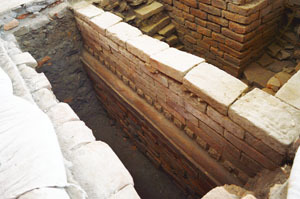 In the Republic of Armenia, numerous organic substances such as fibers have been unearthed from archaeological sites. 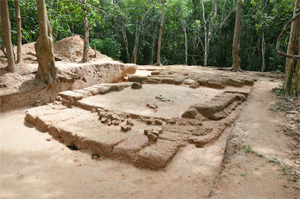 However, they do not have sufficient knowhow to preserve such artifacts. In addition, several religiously and historically valuable items, including ritual clothing and accessories, handed down since ancient times are stored in the Mother See of Holy Echmiadzin, which is registered as a world cultural heritage site. 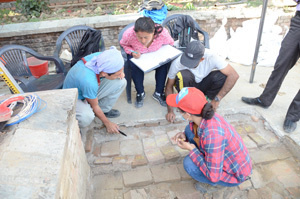 Among them, however, some are seriously damaged, so it is necessary to restore them in the proper manner for smooth transfer of precious cultural heritage to the succeeding generations. 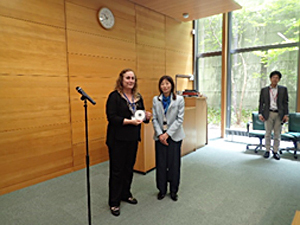 For this workshop, Dr. Mie ISHII, a visiting researcher from the Japan Center for International Cooperation in Conservation, and Ms. Midori YOKOYAMA from the NHK Culture Center Saitama were invited as lecturers. 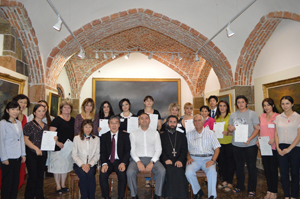 The first half of the workshop was conducted at the Scientific Research Center for Historical and Cultural Heritage while the second half took place at the Museum of the Mother See of Holy Etchmiadzin. Thirteen trainees from seven institutions handling cultural heritage such as museums attended the seminar. This first workshop was designed to learn basic knowledge and techniques on textiles. We will continue this cooperative relationship to enable them ultimately to preserve and restore their cultural heritage by themselves. Pro-democracy movements in the Middle East that originated from the Arab Spring have caused major changes in the Arab world. A large-scale democracy movement began in Syria in April 2011, and where this swell will lead is not known. The nation is currently in a de facto state of civil war. Syria has already experienced over 100,000 deaths, and many citizens have been forced to flee. Opposition is growing as Syrians flee to neighboring countries, and there appears to be no end in sight to the conflict. 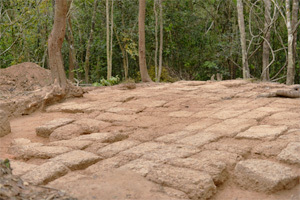 As the civil war unfolds, the destruction of cultural heritage has again captured headlines around the world. Aleppo, Syria’s second largest city, is renowned as an ancient capital with scenic views, but the city has been home to severe fighting during the war. Cultural heritage is at great risk, as evinced by the burning of historical souqs (markets or bazaars) that led the city to be inscribed as a World Heritage Site and destruction of the much of the Ancient City of Aleppo. In light of continued fighting, UNESCO’s World Heritage Committee placed all 6 of the World Heritage sites in Syria on the List of World Heritage in Danger on June 20, 2013. 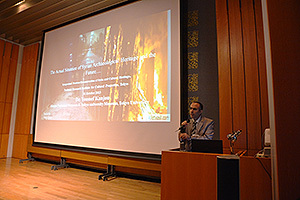 In light of these circumstances, the National Research Institute for Cultural Properties, Tokyo hosted a symposium on “Syria’s Recovery and Its Cultural Heritage” on October 31st with the backing of the Japanese Society for West Asian Archaeology. During the symposium, presentations were given by 9 experts, including Dr. Youssef KANJOU, the current Director of Antiquities and Museums of Aleppo. Presentations covered the Current State and Future Direction of the Syrian Civil War, Syria’s History and Cultural Heritage, the Extent of Destruction of Cultural Heritage by the Syrian Civil War, and Restoration of Cultural Heritage and National Recovery. A panel discussion followed the presentations, where the topic of What Should Be Done to Restore Syria’s Cultural Heritage Now and in the Future was actively discussed.